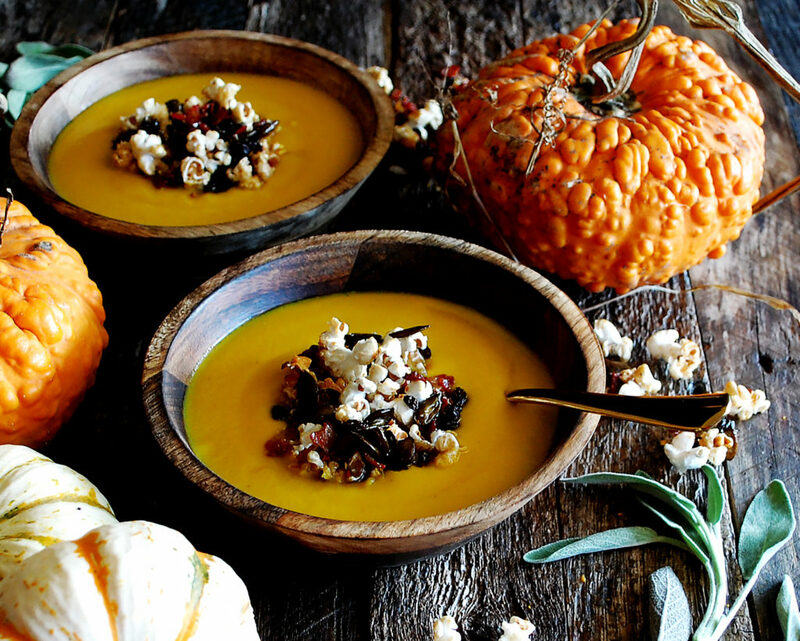 It’s Halloween weekend, and I couldn’t think of a better way to celebrate than with a spooky pumpkin bacon soup …and some chocolate, of course. Can you guys believe it is already Halloween? It feels like I was just making this harvest salad to celebrate the first few days of fall, and now we are well on our way to the holiday season! I am actually so excited. Fall and the entire holiday season is my favorite time to be in the kitchen. There are just so many fun gatherings to cook for, and so many cozy nights in as well. For those of you who don’t know me, I definitely prefer cozy nights in over just about anything! Nothing beats a chilly fall night with the fireplace on, music playing, and stove heating up to cook something extremely comforting. And comfort is what this pumpkin bacon soup is all about. 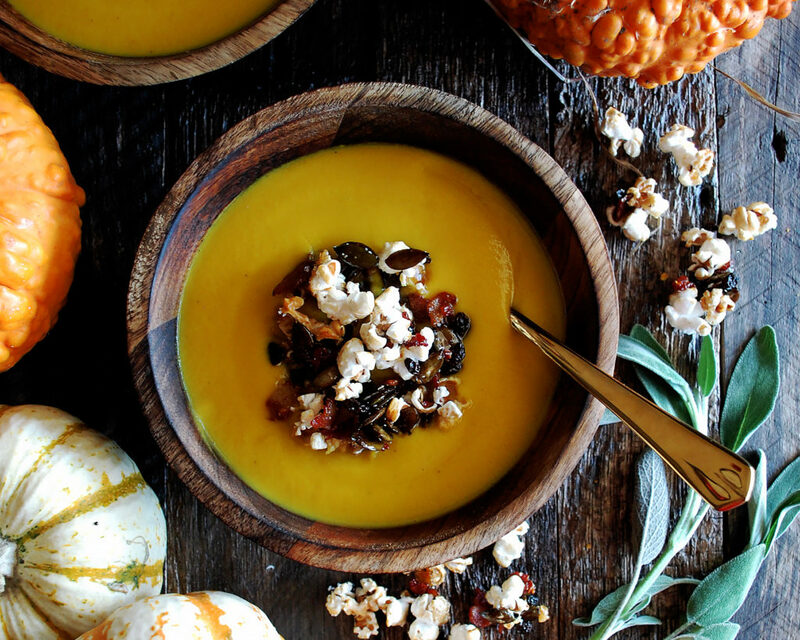 To be more specific…roasted pumpkin bacon soup with popcorn granola. YUM. I’ve been accumulating so many beautiful pumpkins, so I figured it was about time I roasted a couple and turned them into a soup. There is nothing difficult about this soup at all. 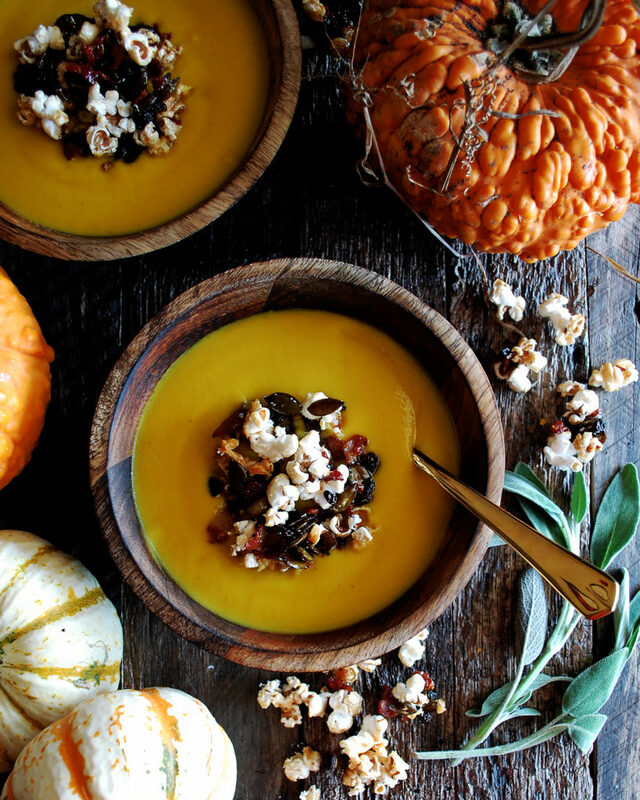 Once the pumpkins are roasted, everything comes together in one pot and then gets blended until creamy. It’s got a really nice bacon flavor throughout, plus sage and sweet apples. I love what the apples do for the flavor of the soup, so I definitely would not leave those out. 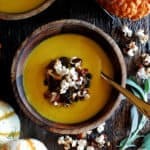 I didn’t add any cheese to this soup, but I think it would be amazing with a really sharp cheddar cheese, kind of like this butternut squash soup I made awhile ago (still one of my holiday favorites). And for a really fun, special touch: the popcorn granola!! Nothing fancy here either, you basically reduce some honey in a pan and toss in the popcorn, some pumpkin seeds, dried currants, and the crispy bacon from the soup. It is super yummy to snack on and makes the best crunchy soup topping. I will definitely be making this on Halloween, and I hope you guys do, too! Preheat the oven to 400°F. Carefully cut the ends off of each pumpkin. Leaving the skins on, quarter the pumpkins. Scoop out all of the seeds. 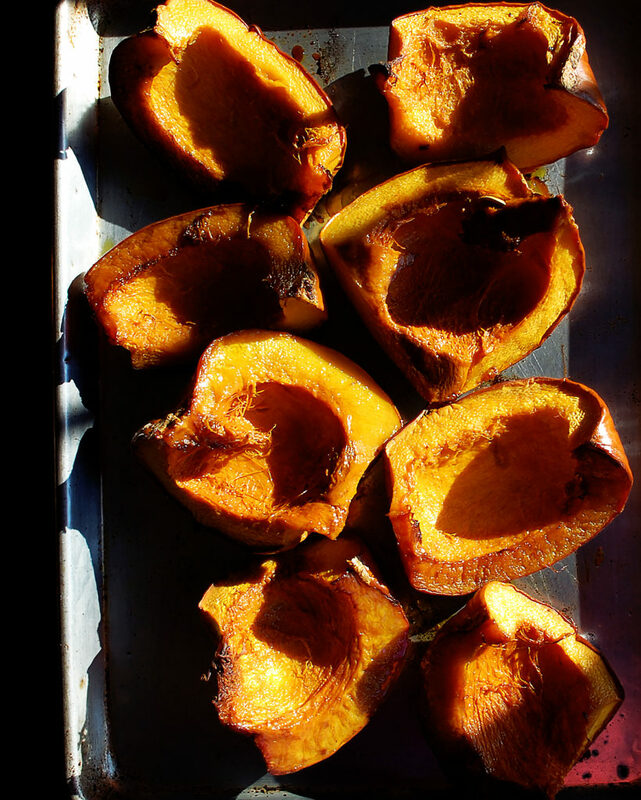 Place the pumpkin quarters onto a baking sheet and drizzle with a generous amount of oil. Season with salt and black pepper. Roast the pumpkin for 30 minutes. Lower the heat to 350°F and continue to roast for another 45 minutes. Let the pumpkin cool slightly so it is cool enough to handle. Peel the skins off, or use a spoon to scoop out the flesh. Discard the skins and reserve the flesh for the soup (you’ll want to end up with 2 pounds of flesh). Heat a large, heavy-bottom pot (I use my Le Creuset) over medium heat and add the bacon. Render the bacon until it is crisp, stirring often. Use a slotted spoon to transfer the bacon to a plate lined with paper towels, leaving behind the bacon drippings in the pan. Add the olive oil to the drippings and let heat. Add the onions, apples, and sage leaves. Stir to coat and season with a pinch of salt. Let the mixture cook until the onions and apples are tender. Add the roasted pumpkin and chicken stock. Let the stock come to a boil. Reduce the heat to low and let the soup simmer for about 10 minutes. Working in batches, ladle the soup (you’ll want to evenly distribute the solids and liquid for each batch) into a blender. Blend for 1 1/2 minutes, or until completely smooth. Strain the soup into a large heat-proof serving bowl or a clean pot. Stir in the heavy cream. Season with salt to taste. While the soup cooks, combine the honey and water in a sauce pan over medium-high heat. Let the honey dissolve and the mixture come to a boil. Boil the mixture for about 2 minutes until slightly reduced and syrupy. 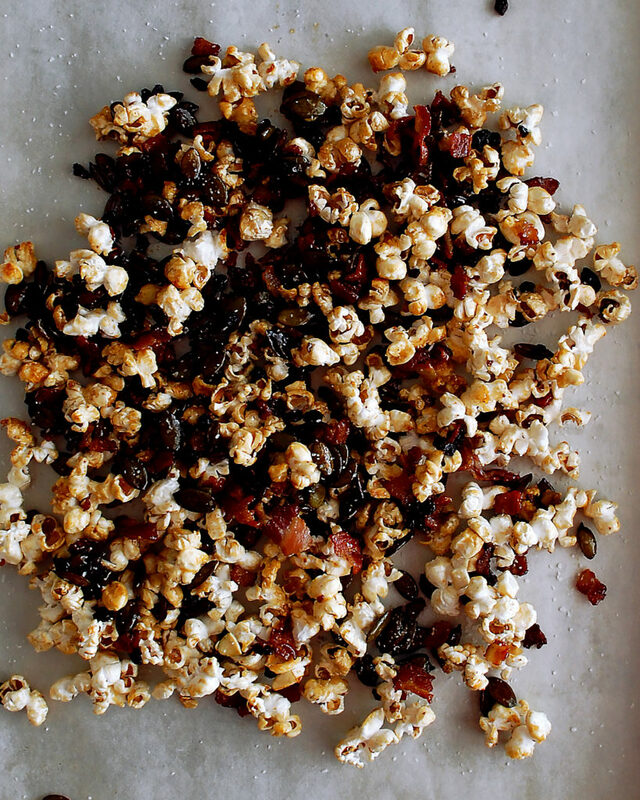 Stir in the popcorn, pumpkin seeds, dried currants, and cooked bacon. Stir very well, making sure that every ingredient is coated with the honey mixture. Prepare a baking sheet with a piece of parchment paper. Spread a little oil onto the parchment paper. Pour the popcorn mixture into one evenly layer onto the parchment paper. Season with salt immediately. Let cool. 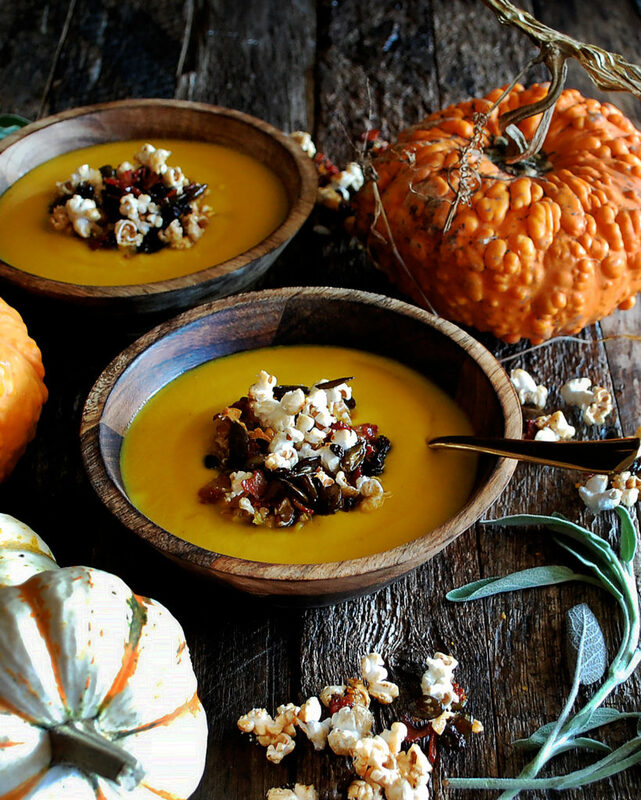 Serve the pumpkin soup warm with a sprinkle of popcorn granola on top. a little about me, kayla. Hi! 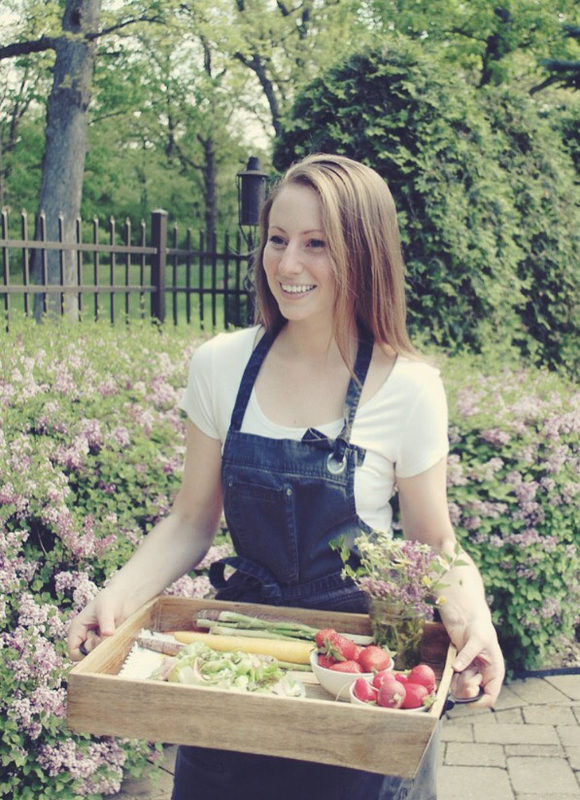 I could not be more excited that you’ve found the space where I get to share all of my food creations and love for cooking with you! Simply put, I love nothing more than lighting a few candles, putting on some music, standing in the kitchen and letting my mind dream up what I’m going to cook. don’t miss a recipe with posts sent straight to your inbox.